The sequel to one of the best iPhone games has arrived, jammed packed with even more fun than ever before! “Rolando 2: The Quest for the Golden Orchid” takes us back to the days of pirates and their quest leads us through tropical beaches, ancient ruins, volcanic caverns, and jungles. The new cast of characters in this adventure/puzzle game will surely make you smile! As the story goes, Sir Richard Buttons-Smthe, a brave young Rolando, returns home to the Kingdom of Rolando to report of his adventures to the King and Queen. As he tells the Sages of his adventures, they suddenly fall ill, showing symptoms of the Kilgorean Flu. Sir Richard mentions that the only cure for it is the “fabled Golden Orchid, atop the great Mount on the Isle of Fontanis.” So the King sends him back to the boat, along with a new team of Rolandos and that’s how their adventure begin. Just like in the previous version, you can tilt, tap, swipe, and use multi-touch controls to move your Rolando along. Each Rolando can do specific tasks. Some can float in water, while others sink to the bottom. Some can float in the sky, while others can stick to walls. Each Rolando has different uses in each of the levels, and finding out how they can help is only half the fun! There are many more tricks and abilities to learn in this game, and you’ll find it hard to put down. Within each level, there are also three different types of bonuses that will earn you points: save all the Rolandos, collect all the crystals and gems, and beat the challenge time. Just like the first Rolando game, beating the challenge time is still the most difficult. The iSave feature is also available to save your place in case you turn off the game. There are 46 different levels that span over 6 different adventures. The gorgeous illustrations from the talented Mikko Walamies will surely impress you, as well as the new pseudo-3D graphics in the levels. And what’s a game without music? Enjoy the bouncing rhythms from Mr. Scruff as you head off in your journey. For your listening pleasure, you cam tour Mr. Scruff’s music shack in the game and sample each tracks. New to Rolando 2 is the introduction of Golden Idols. These will allow a player to skip the level and move directly to the exit doors. This is handy in the more challenging puzzles. Golden Idols are hidden throughout the the levels of the game. Collect them and use as needed. Rolando 2 gameplay is also more social. It has Plus+ enabled, which is a game social network that allows you to connect to a large community of iPhone gamers. Play to unlock game awards and save yourself a spot on the leaderboards. You can also post game challenges via Facebook status, email, or a direct challenge (with Push Notification), which adds another interesting aspect to the game. Rolando 2 is everything an iPhone game should be and more. The music, graphics, and game play are very polished and just flows together nicely. For the price of $9.99 in the iTunes store, Rolando 2 proves to be worth every penny. 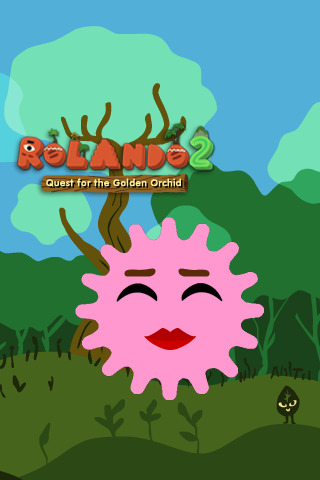 For more Rolando-related fun, check out the Rolando 2: Quest for the Golden Orchid website! There, you can create your own Rolando and vote for the best creations! Here’s my Pinkie Spikey Rolando. Be sure to make your own!